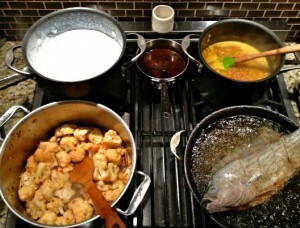 For our first Cookbook Club of the year, we met at Chef Heidi’s house. The featured cookbook was Vietnamese Home Cooking, a delightful book of recipes by Charles Phan of the great San Francisco restaurant: The Slanted Door. When the wine glasses were filled, my fellow chefs nibbled on some cheese and we each pulled out containers of prepped recipes to finish “on location”. Unfortunately for me, I was on day 8 of a 10 day detox. I was left to nibble on plantain chips and drink sparkling water as the cooking aromas filled the house. First up: the first course. I prepared the Green Papaya Salad with Rau Ram, Peanuts and Crispy Shallots. I quickly found that this cookbook read like Julia Child’s. Recipes like my papaya salad seem simple at first glance, yet it takes 6 pages of recipes to complete the dish! Recipes for pickled carrots, flavored fish sauce and crispy shallots each had their own pages throughout the book. The group loved the dish for it’s beauty as well as it’s taste. One downside: the crispy shallots were supposed to be double-fried, but when put in the hot oil for round two, were instantly burned! They went straight in the garbage, but the salad was delicious nonetheless. Liz also made a Spicy Mango Salad with stir-fried mango, a variety of spices and a similar fish sauce, that was simple and delicious! 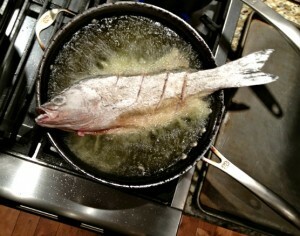 Heidi made a Crispy Whole Branzino for the entrée. It was a spectacle to watch, especially flipping the fish in the hot oil — which turned out to be a 2-man job. As the host, she gladly took the help and knife skills of David, who brunoised mango for the sauce. The finished dish was a beast, nearly overwhelming Heidi as she proudly displayed her (and David’s) final product. Lemongrass Marinated Pork was prepared by David. 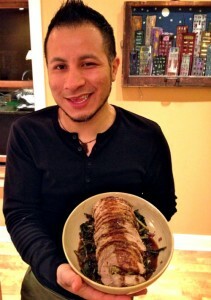 In lieu of chops, he made a filling and stuffed a loin. It was beautifully tied, seared and roasted. 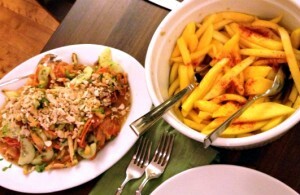 The sauce was similar to the marinade – heavy on lemongrass, shallots, garlic and, of course, chilies. 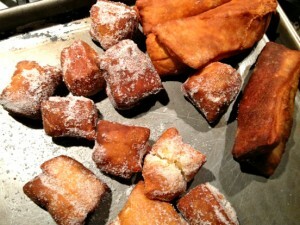 Alissa made Chinese Doughnuts – this is where my detox was really hard to stick to. 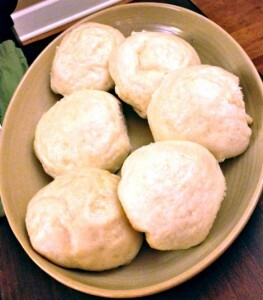 The warm, sugared doughnuts hit the spot and calmed cravings for a sweet conclusion. The book called for rather large donuts, but Alissa cut them down to little do-nuggets (Get it?!). The perfect end to a fun night with friends, colleagues and Vietnamese home cooking! If you’d like to get cooking with our Chicago team, contact us! We can help you plan the best corporate event your company’s ever seen! (Sound like big words? It’s what clients are saying!) You can also see these chefs in action at one of our public cooking classes in Chicago!